I don’t know about you, but I used to really struggle with prayer. My lackluster and inconsistent prayer life made me feel bored and guilty. But then I discovered the key to the prayer life I always wanted–a prayer life that is enjoyable, effective, and enduring. I discovered my best prayer types. So can you! The prayer assessment is the starting point of finding your best prayer types. We recommend that you take the assessment first and then read the book. The assessment is a series of statements about your prayer life. You’ll read each statement, then select an answer that most closely relates. After 60 statements, you’ll have the option of stopping or going on. If you stop, you’ll receive your results immediately. If you go on, you’ll receive 60 more statements, then the results. On the results page, your top prayer types will be highlighted. Scores for all of the prayer types will also be displayed. You can share your results via Facebook, Twitter, or e-mail. Simply use the controls on the screen. If you entered your e-mail address, you’ll also receive your results via e-mail. If you do not receive an e-mail from CS (at) CSHeinz.com, please check your junk or spam folder. After taking the assessment, read the book to compare your results with the chapters. The assessment is not intended to do apart from the book, it’s a starting place. For the best experience, we recommend you: 1) do the assessment; 2) read the book; and 3) share the experience with your community. Through my book and prayer assessment, you can receive a fresh vision for prayer and identify your best prayer types. Find your voice. You were made to pray! The book contains 12 different types of prayer, prayer assessment, discussion questions, prayer type chart, and conversation starters. This book could radically change how you see God, your life, and your ministry. I believe Made To Pray will find itself on your “best prayer books” list. Chris Heinz has a true passion for prayer. I’ve watched him energize audiences with his provoking thoughts. You’ll be energized, too, if you embrace his teaching. Too much teaching on prayer is made of platitudes, sugar-laden sentiment, or guilt-inducing directives. But not this book. Chris Heinz has given us a language for prayer. This isn’t merely a book to be read, but a book to be experienced. I look forward to seeing what it unleashes in the lives of individuals and the church at large! 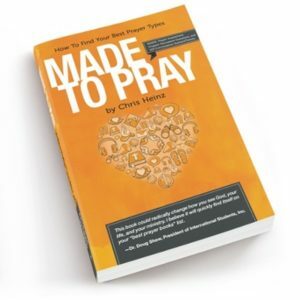 Made to Pray is a fresh, biblical guide to developing a satisfying and fruitful prayer life. It’s a must-read for the Body of Christ as we seek a much needed prayer awakening in this generation. Made to Pray offers a refreshing new perspective that focuses the reader’s attention on God, his ability, his promises and his performance! Guilt-free and grace-full, Made to Pray brings out the fun in prayer and demonstrates how effortless communicating with our heavenly Father was meant to be. I wld like to purchase a copy how do I go about getting one?.. Barnes & Noble or download an e-book. I pray God blesses your richly! This is the first time I watched your awesome and inspiring trailer. Thank you Chris Heinz for your prayer assessment it will be beneficial to all that come across this site. Jesus told us to “Watch and pray.” AND PRAY. More important at this time in history than ever before as His return nears! You are right on target regarding prayer. If everything seems good we don’t pray. If we are to busy we don’t pray. If we don’t read the bible, we don’t pray. Prayer has been diminished greatly due to happiness, success at work, etc. I have found a great way to start back your prayer life. I am reading a chapter a day from a Max Lucado book. I read the chapter, pull out the salient points and pray about the points. This can be done with the bible as well. Choose a book a read a chapter a day and then pray over what you learned and your own thoughts and needs. I keep a diary on this for future reference. Takes anywhere from 30 to 60 minutes. Oooopppps! There is the problem. Who can give up 30 or 60 minutes a day in this hectic life. Well, everyone has to search for something to cut out in order to do it. The easiest for me is the first thing each day. I am so blessed reading your book, Chris! It reignited the desire to pray and enjoy it. You were certainly raised for this as really, there are more Christians struggling with their prayer life than those who don’t. Thank you! By the way, we are starting a new series of Learning to Pray in our children’s home and we will use your book as our reference. I am reminded when one of our new kids told me that she wants to learn how to pray. I suddenly realized, there are new big and small people in IFL (you know where they come from). I remembered your book. Tita Pat approved immediately. Thank you for giving us copies of this very precious book! Instant favorite.